Experience the excitement of the Aquarium from behind the scenes! Do you have a budding marine biologist in the family? 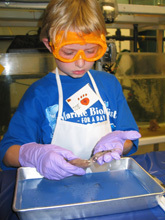 Our Marine Biologist for a Day program takes kids behind the scenes where all the scientific action happens. 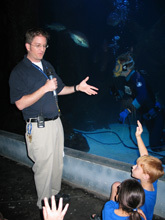 Let them learn about underwater species directly from our biologists! 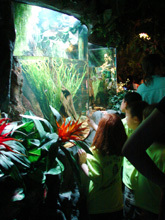 Learn fun and interesting facts about our incredible marine life and the 200,000 gallon fish tank which they live in. You’ll also learn about the importance of our world’s oceans. Group Q&A sessions with one of our staff Biologists are also available upon request. Learn about the Aquarium’s inner workings, from filtration to fish food preparation. Learn about the Aquarium fish tanks, resident aquatic life and the importance of our world’s oceans.